"The 4-in-1 Touch Steering Chic tricycle is the ultimate outdoor experience. Equipped with patented Touch Steering technology, the Chic enables parents to steer the trike just like a stroller, directing it easily in any direction with the lightest touch of the parent handle. The red navigator button allows for easy transition to child steering control. 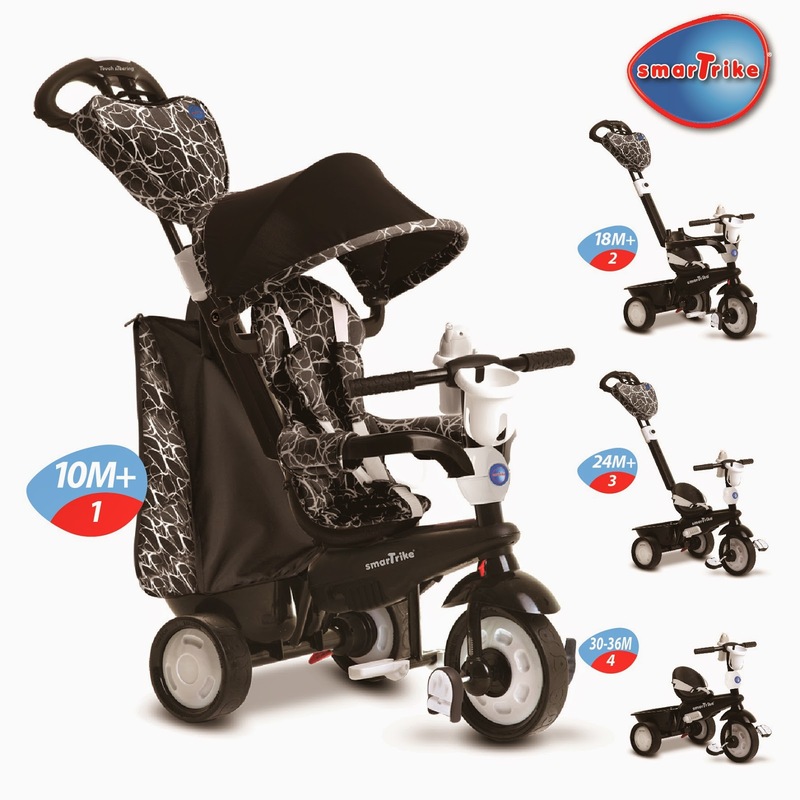 Its 4-in-1 capability allows the trike to grow with your child from the age of 10 months up to 3 years old." Kids like to be independent, but they don't always have the ability to do what they want to do. The smarTrike is a great item to have for those times. It allows them the independence to ride a bike and do something fun (that their older siblings might be doing) but still allows the parent to control it. I can remember many times being out for a walk with my kids, and they would be on their tricycle. Half way through our outing, they would be tired and not able to continue home.....which left me carrying them AND the trike. This would have come in so handy on those times, as I would have been able to push them home. Tales of Mommyhood is happy to offer our readers the chance to WIN their very own smarTrike in black. Open to Canadian residents that are 18+ (excluding Quebec). To enter, fill out the form below. I love that it's 4 in 1!! I am all about multiple uses for things. I like how it grows with your kid as your kid grows up. I love that it is 4 in 1. I like that it is easy to assemble! It only takes a few minutes! I also like their Springo! Love that it will last for a number of years due to growing with them. This would be great for my child (who is on strike from the stroller) when we need to get places a little quicker! I really like that this bike will grow with your child! I love that I can use the same trike for years. 4 in 1 is the way to go. I love that it grows and changes usage.. you can steer or allow your child too. My fav is that it can be used for such a long time. I love that it grows with the child. So many toys become obsolete so quickly. My DD loves her basic trike, but this one is much cooler! I love how it grows with the child! I'd love it for my son. The touch steering sounds great! I love the handle. So much easier on the back!! I love that I can use it for my child for many years since it grows with my child and adjusts to what she needs as she grows. I love that this grows with your child, making it comfortable and safe for them for a long time! I love how it grows with your child, so it will be a product that can be used for years. I love that it grows with your child, such a great feature !! I like that it grow with the child. I love that the bike is able to change to suit the needs of the child. I also love that while mom or dad pushes them at first, the child also gets the feeling of independence too. I love the colors, and that they look a little more sturdy than the one I have made by a different company. I like the sun/rain covering. The 4 in 1. I really want it!! It steers like a stroller for the first stage. That sounds easy, and useful. I like the touch steering and that it grows in stages with your child. I love the removable parent handle! I love the versatility from 10 months to 36 months. What an awesome product that will be such a great companion to any little one. I love how easy it is to change things over. I like that it only takes a few minutes to assemble. It would be great to win a Black SmarTrike. and tell you one of the features of the SmarTrike i like most. I like that it grows with your child and only takes a few minutes to assemble. I love the idea of this SmarTrike growing with your child. I like the non-slip pedals. I like that it goes from 10 months till over 3 years old! Great to get lots of use out of it. I love that you don't have to worry about a new one for yrs. And the Touch Steering is awesome. My favourite feature is the adaptability - not only that it can be used for such a long range of time, but also that it can be used starting at such a young age. My youngest (1.5) really wants to ride a bike like the big kids, but is too small - this would make her feel like one of the big kids! I love the touch steering feature the best...although I think the idea that the trike grows with your child is great. Awesome bike that looks like you can use for a long time !! Easy assembly is always a bonus! The canopy of great as my little one refuse to have anything on her head. And it grows with the child. Could ask for a better designed trike! I love that it converts from a stroller (trike with a handle) to a regular trike. I love that it can easily switch from parent controlled steering to child controlled with no life issues. I love how it grows with your child ,! I love that it is 4 in 1!!!!! I like that they have a sunshade and storage bag/basket. I like the ability to transform as the child gets older. You get a lot of use out of it. I love that it is easy to assemble, easy to handle and grows with the child. Bailey Dexter I really like that it is a 4 in 1, so it grows with your child throughout the stages.What is really nice about it is also that you have control of the bike and the kids can still have fun! I love that it grows with your child....must more cost effective. i like the touch steering! How can you not love the fact that it grows with your child! Melanie P.
OF course my favorite feature is how it grows with the child! I love that it turns into a bike! I like the age range it can be used for! i love the colour co ordination but I like the simple fact it can transform as your child grows or be used by kids in similar age groups.... I am about sharing toys so if we buy one everyone should get a chance to utilize it. Whether kids born close together, or cousins, even neighbour or friend's kids; why not share? It is amazing to be able to have a transformative feature to allow one child or many children to use the "toy"/sport item. I love the fact that it is versatile. Little kids have so much stuff that takes up so much room. This is a stroller, trike etc. all in one. And it is for a wide age range. Love it.